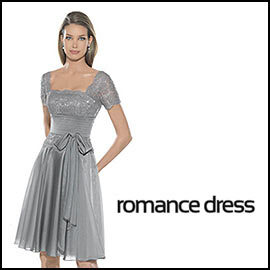 Here's an elegant silver knee-length homecoming dress with short sleeves. It's a chiffon dress with an empire waist, and intricate lace on the bodice and the sleeves. It's offered by Romance Dress, a China-based company. At the time of this post, it was listed at about a hundred bucks. As always, when ordering from foreign companies, we urge you to look for online reviews of the business, and if you decide to order, be sure about the company's return policy, and order early so that you'll have plenty of time to determine if the dress is right for you.